Expanding and developing the Graduate Union as a bigger residential college with quality accomodation for postgraduate students and visiting academics, and to provide better meeting and function services to the public in the pursuit of advancing education for social good. The only dedicated postgraduate residential college in Melbourne and open to graduates of all other universities, Graduate House is a safe, mature collegiate environment, providing high-quality accommodation with nutritious food and other services. With multiple rooms, the Graduate House provides Meeting and Function services to over 2,000 people every month. 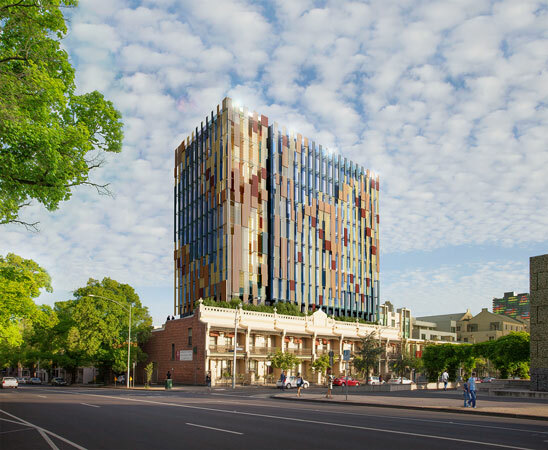 The 50 million dollar fundraising campaign to enhance postgraduate living in Melbourne. The Diamond Jubilee Campaign is to build a platform to support the creation of experts, to be the nursery of professsionals, to create collaborative work spaces and to provide a home away from home for residents undertaking their postgraduate studies and visiting academics. This $50 million dollar campaign addresses the transformation of education with the necessary support systems. For the fortunate graduates who live at Graduate House, negative situational factors are greatly minimised through inclusiveness and the provision of healthy meals, utilities and amenities. Graduate House provides postgraduate students with a unique and appropriately balanced lifestyle customised to their distinctive needs. Although there has been a massive increase in postgraduate student enrolments, there is a lack of supportive infrastructure in place to support those undertaking study. The Graduate Union has challenged itself to meet this demand, and bridge this gap by providing supportive infrastructure and increasing our provision of a collegiate living environment for the under-served graduate population - our future. “I feel Graduate House is the right place to stay because it’s vibrant and really rich. It gives me a lot and much more than I expected. It’s like a cultural exchange. The Graduate House seeks to support these Graduates. and in other university - affiliated accomodation. “I think where Graduate House really helps the world – changes the world – is by allowing students to achieve their best while they’re spending time at universities around Melbourne, such as Melbourne University. - Past Resident, Graduate House. Your giving can help create a new story of a life impacted by the benefit of collegiate living. The Graduate House provides the perfect meeting place to connect with our association of over 2000 members from across the globe. By developing the Graduate House, you also help accomodate and expand a larger membership association that you can tap into and connect with. By partnering and donating to The Graduate Union, you get access to a pool of high calibre graduates from various disciplines to network with and build connections. Hand the baton to the next generation and help them create opportunities and stories for lifelong learning. The Graduate Union must expand to continue its central role in giving alumni access to professional development opportunities and networks, establishing mentoring linkages, engaging in important dialogues, and fostering connections through research, science and innovation seminars. Donate now to keep the collegiate experience alive for those that are shaping our collective futures for our children. Imagine having a space where you can live comfortably, enjoy great food with amazing company, where your rooms are maintained for you and is in a great vicinity - in the heart of Melbourne, and situated between two of Melbourne's prominent universities! This is what Graduate House offers! Donate now, to expand our College with many more rooms to accommodate more students like you. The Graduate House provides you the perfect place to host meetings and functions with amazing catering to service your needs. Donate now so you can have state of the art rooms and services for all your event and programme needs! As leaders and influencers of future generations, be a part of transforming education with the necessary support systems to help students and other academics in their pursuit of learning and inquiry. Donate now to create more collaborative meeting spaces for people from different careers, experiences and backgrounds. To support our Diamond Jubilee Campaign, is to support education, support knowledge and support the advancement of education for all. As a Not for Profit, education based charity, the Graduate House stands with other Not for Profits and Charities in the pursuit of their cause. The Graduate House provides meeting spaces and also encourages Resident Members to participate in activities hosted by external organisations. Donate now to create more meeting spaces to facilitate activities for Not for Profits. The Diamond Jubilee Project is of a singularly grand scale for our organisation that will take place over at least two years. Although fundraising for this campaign is a mammoth task, it is an ongoing process. We are seeking to partner with all our members and donors to help reach our target and keep to our redevelopment schedule. By donating today, you are increasing our ability to nurture and attend to the well-being of a greater number of postgraduate students, minimising negative situational factors that can lead to depression and early departure from study. You are contributing to more than just the well-being of a select few. Whilst postgraduate students are ‘lone wolves’ during their study years, they go on to become the world’s pioneers and leaders in innovation, often improving quality of life for all of us. By donating to this campaign, you are partnering with us to enhance their support systems and hence increasing their chances of success. All donations to the Graduate House and the Graduate House campaigns and projects are tax deductible. The redevelopment of the Graduate House and the residencies will start after we have raised $50 million dollar target (OR HALF THE PRICE) This is to ensure that once the refurbishment starts, we will be able to complete it. How long will the redevlopment take to complete? The redevelopment of Graduate House with 11 storeys above ground and 5 basements is a long task that will take place in phases. The redevelopment schedule including the fundraising, detailed design tenderin, and building construction before the structure becomes operational could take approximately five years. The fundraising period for $50 million is approximately 12 months, followed by the design tendering and approval stage which could roughly take 6-8 months. The actual construction could approximately take 30-36 months. Improving the Graduate Union as a hub and residency house for thinkers, inventors, professionals, academics and for people who change the world through the advancement of education for social good.